McCain got a new BlackBerry device in January. WASHINGTON (CNN) - John McCain said during the presidential campaign that he "never felt the particular need to e-mail," but he has apparently developed an urge to Twitter. McCain recently began sending tweets to the more than 88,000 Twitter users following him online, offering brief updates on floor votes, media appearances and his hometown Phoenix Suns. "steve nash hurt? amare too! what now for the suns!," he wrote about the Phoenix Suns on Wednesday. Senators have been slower than their House colleagues to embrace the micro-blogging technology, but several members of the upper chamber - notably Missouri's Claire McCaskill and Iowa's Charles Grassley - have been among the most prolific twitterers on Capitol Hill. While other senators appear on Twitter, many of them (or their staffers) simply use the site to send out formal-looking messages and press releases. But McCain spokeswoman Brooke Buchanan told CNN the Arizona Republican is sending out his own authentic tweets. According to his Twitter page, the senator is following updates from a handful of journalists who covered his campaign, as well as from a few members of his South Carolina campaign staff. Buchanan also revealed that McCain is now wielding a brand new BlackBerry, which he picked up in January. That marks a great leap forward for the senator, who spent the campaign attached to his Motorola Razr phone, but never used a PDA. Throughout the campaign, McCain suffered from the perception that he didn't quite understand the Internet, an assessment that proved damaging in a race against a young, tech-savvy opponent. In an interview with the New York Times last July, McCain said he knew how to use a BlackBerry, but that he didn't have his own. "I use the BlackBerry, but I don't e-mail, I've never felt the particular need to e-mail," he told the paper. maybe now he can keep up with what is going on in America..
Not right or left - Forward! Is this the same guy whose party criticized the absence of a suit coat in the Oval Office as being "unprofessional" and too informal? The Republican hypocrits are all for stuffed shirt appearances when it's their guy – but how disrespectful of the President is it to be doing the grown-up version of playing with a Nintendo while the President is speaking to you? What a bunch of children! Isn't McCain the one who also criticized the helicopter purchase – the one who crashed enough aircraft to more than pay for a few helicopters in his day? Twitter, twitter – what's the mitter? Don't these people have enough problems and challenges to fill their time without playing amateur newsmen on their Blackberries? Get back to work – and, as your party said – show some respect! Is CNN running out of news? What a WAST all you HATERS are! Get a Job, accomplish something! The fact that our new Administration is in place today because of you makes me sick! You’re Hate and Anti-American sentiment is the downfall of our nation! I am laughing so hard I can't write! McCain the real deal, haha, man, i love people that butter you up with service to the country, as if it didnt feed the fire of BS back then just like joining is doing now. If you dont think old age has alot to do with the dumb decisions being made maybe you shoulnt open your mouth till your that old, dont you have parents?? dont you notice the changes or......wait....lemme guess they get smarter as they get older right? i wish ignoring things made them better, if they did, we'd have a Republican president. I agree maybe new talking points or even reading a book about what really happened in vietnam while you were in that pow camp, maybe touching up on economic skills all things concidered..naw....lets just keep being meatheads. Perfect example of old people running the country-Bush and Rumsfeld, might as well be in space, good ole Rums looking up words in the dictionary like geurilla warfare and insurgency, why? becuase hes a dumby. Let me tell you, you defenders of these idiots are in real good company. He didnt know the definitions because apparently he thinks these tactics are new....go figure, i bet alot of you think that. Everyone i know is very happy to have these clowns sittin in the back where they belong. Hate is hate! You don't like it when a white guy gets hated on but you stand by when blacks get hated, even when the life of our President is blatantly threatened! You then all of the sudden "didn't see the comment that way". Well some people don't see that the comments here are hating on McCain. You can sure dish it out, but you can't take it. I am not saying hating is right, but it you can't take the heat, shut up yourself! Geesh! And we almost chose him for President! Gosh! How about a high tech brain. I recently gave my 80+ year old father a cell phone to keep for safety. It sits on a shelf, battery flat, unused. He found the technology to daunting. Unlike McCain, he DOES send/receive emails and use a PC. There's room on that shelf for McCain's Blackberry. I'm sure that is what John will do with it very soon. The longer we see what kind of government a Democratic Administration supoorted by a Democratic congress turns out to be, the smarter John McCain turns out to be. He described it in great detail during his campaign, but apparently not enough people were paying attention. 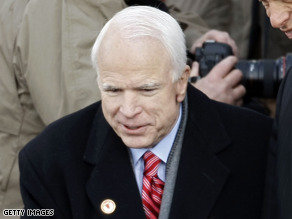 John McCain is a brilliant man and a dedicated public servant we are fortunate to have working for the American people. The longer we see what kind of government a Democratic Administration suported by a Democratic congress turns out to be, the smarter John McCain turns out to be. He described it in great detail during his campaign, but apparently not enough people were paying attention. Sen. McCain 2.0 never even had an E-Mail until 2008. He was choice number 2 for president what a joke. That just goes to show you what puppets the elected are. How are you going to run the super power USA if you don't even know how to send email.